Friday's CBS This Morning touted Oprah Winfrey's recent Harvard commencement speech, airing over a minute of half of footage from the former daytime TV host's address. The morning newscast spotlighted how Winfrey took the opportunity to promote two liberal pet causes: gun control and "a clear path to citizenship" for illegal immigrants. The show's three anchors all sang the billionaire's praises. Charlie Rose gushed over Winfrey's "remarkable speech". Norah O'Donnell trumpeted the TV star's "important message". Gayle King, who is Oprah's longtime friend, marveled over the address: "She did a great job yesterday." The three hosts didn't once mention King's close connection to Winfrey [audio clips available here; video below the jump]. I’ll tell you why I apologized. I felt like Sarah Palin was somebody I wanted to continue to be able to make fun of and I felt like if I don’t apologize, if I don’t sincerely express my regret, I will not be able to go forward making fun of her. Even if Obama loses next week, the media goo machine will keep cranking away. The new TV Guide is already speculating: “Will Michelle Obama Be the Next Oprah?” Writer Stephen Battaglio imagines what a star she could become (if her husband loses). 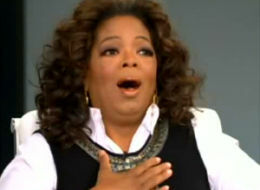 She could be bigger than Oprah? “Michelle Obama is such an appealing TV presence that if she and her husband find themselves moving out of 1600 Pennsylvania Avenue, she’ll have the opportunity to make the transition from high-profile engaging talk-show guest to high-profile talk-show host – arguably the biggest ever in terms of recognition.” Experts agree, like a former CNN president. Opening up the Sunday paper might lead you to the national newspaper supplement Parade Magazine, which devoted its July 10 edition to "Summer Reading" picks. Smack-dab in the middle of the issue is "12 Great Summer Books: PARADE's picks of terrific new reads, in no particular order." But that's not exactly true, since the first six are fiction, and the second six are nonfiction. Somehow it's not shocking that the number-one recommended book is "Faith" by Jennifer Haigh, a novel about a Catholic priest in Boston accused of molestation during the scandal's heyday in the last decade. Publishers Weekly advised, "Although this all-too-plausible story offers a damning commentary on the Church's flaws and its leaders' hubris, Haigh is concerned less with religious faith than with the faith [the accused priest] Arthur's family has — and loses, and in some cases regains — in one another." Historian Doris Kearns Goodwin strangely claimed it was "extraordinary" to have a president care about history, and told the audience Obama said to her in 2007 he’s not getting the presidency to be Millard Fillmore, but to be great like Lincoln. Ali Wentworth, the wife of George Stephanopoulos, painted an incredible picture of a massive gospel choir on the subway system en route to the festivities: "I took the Metro, and everyone was singing ‘Amazing Grace’ on the Metro."